One of the most potentially damaging forces of nature is rain. If your home is not ready for the rain that Mother Nature can dish out during the fall and winter months, you may find yourself dealing with a lot of damage. The first line of defense your home has when dealing with rain is the roof. In order to get your roof ready for the rain, you will need to invest some time and effort. Read below to find out some tips on getting your roof ready for the rainy weather of fall and winter. The main area you need to check when trying to get your home ready for rain are the gutters. The gutters on a home are designed to filter the water produced by hard rains away from the roof and the foundation of the residence. 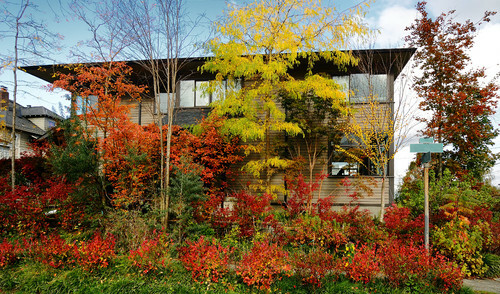 Over time, the gutters on the side of your home will fill up with leaves and other debris. Cleaning them out before the rainy weather moves in is a great way to avoid flooding. By maintaining this part of your roofing system, you will have no problem keeping rainwater away from your home. One of the best ways for you to get natural light into your home is by having skylights installed. These fixtures are both very appealing and functional. The seals that go around these lights are designed to keep rain from penetrating these fixtures and making its way into a home’s interior. As time goes by, these seals may begin to crack and leak. The best way to get a jump on this type of repair issue is by taking the time to inspect these lights on a regular basis. If you detect that there are problems with the skylight seals, you will need to call in a roofing professional to fix them. When trying to surmise whether or not your roof is having repair issues, you need to conduct a post-rain inspection. Once the rain has fallen, you will be able to tell whether or not there are leaks. If leaks are detected, you will have to get them fixed quickly to avoid water damage. The longer you allow a leak to persist, the higher your risk will become for the development of mold or mildew. If you are unsure about where your leaks are coming from, then you will need to hire a contractor to assist you. The roofing contractor will be able to troubleshoot your leaks and get them fixed. A DIY roof leak repair will usually create more damage. Before you decide on which roofing contractor to hire, you will need to get a few onsite estimates. These estimates will give you all of the information you need to figure out which of the contractors is the right fit for your needs. If you’re ready to start your roofing project, please don’t hesitate to call Frost Roofs for any help we can provide you. 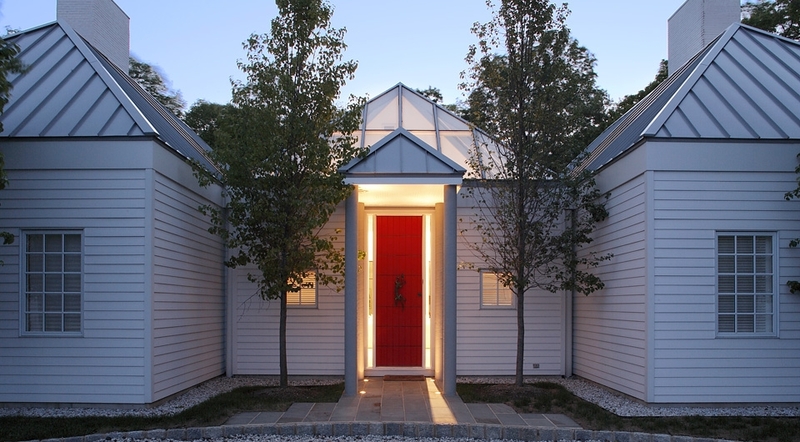 WHAT’S THE DIFFERENCE BETWEEN AN “ARCHITECTURAL” AND A REGULAR SHINGLE ROOF? Architectural shingles are a premium grade of asphalt shingle roofing. The shingles are thicker and have a distinctive, textured appearance. 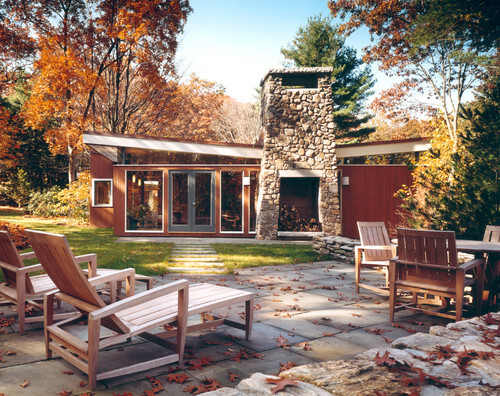 They are sometimes called dimensional or laminate shingles, and were introduced in the 1970s in an effort by manufacturers to create a higher-end product. Regular roof shingles are called “3-tab” in the trade, for the 3 tab/flaps with quarter-inch grooves between them in each panel. 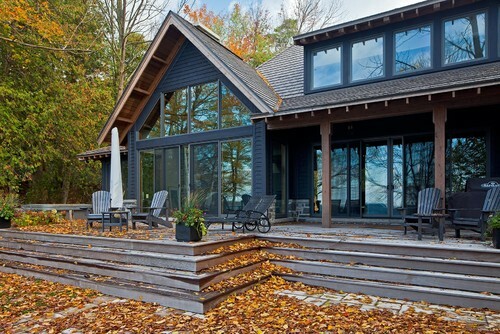 They run in flat, even rows as opposed to the textured and layered look of architectural shingles. Regular shingles have an average 15 to 20-year life. An architectural shingle roof has a 24 to 30-year life, with some super-premium grades rated for up to a 40-year lifespan. 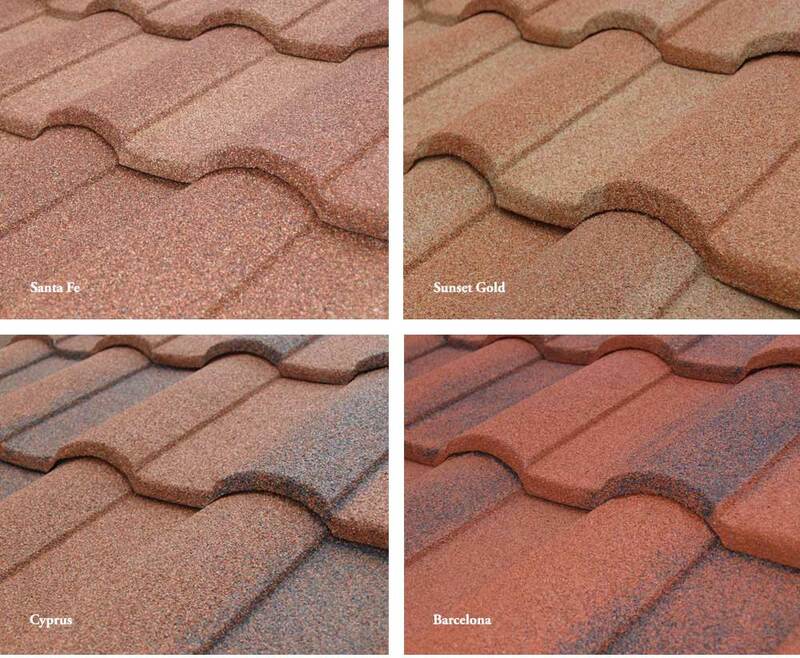 And architectural shingles come in wider variety of colors, subtly variegated color patterns, have greater resistance to uplift in a windstorm, and have a heavier granule covering. All of this comes at a premium price, of course. Typically, an architectural shingle roof will cost about 25% more. But you are rewarded for the extra investment with a 50% longer lifespan and a better looking roof. 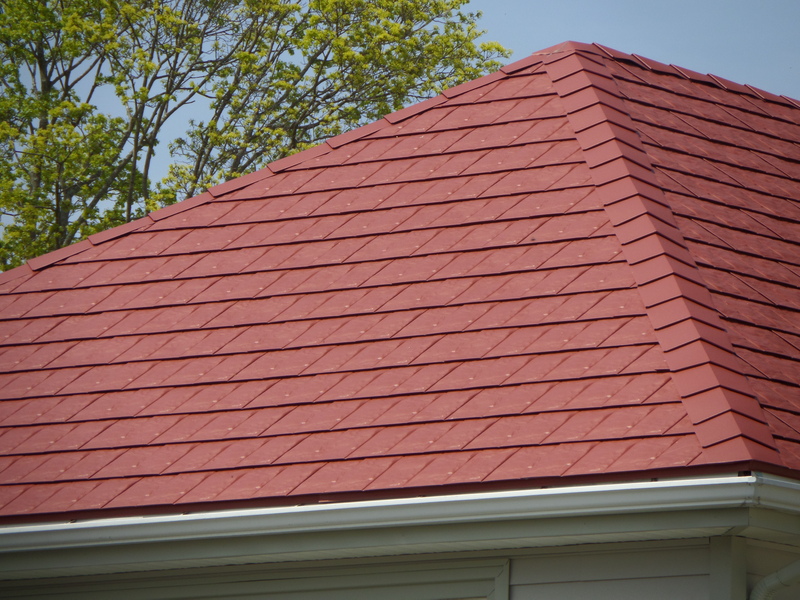 Architectural shingles start with a heavier mat base, typically fiberglass that has been coated with asphalt. Multiple layers are then overlapped and laminated together to create the distinctive texture. The finished product weighs about 100-lbs. more per “square” (a roofer’s term for 100 square feet of roof area) than regular shingles. Builders also like them because minor imperfections in the roof deck are concealed by the texture. 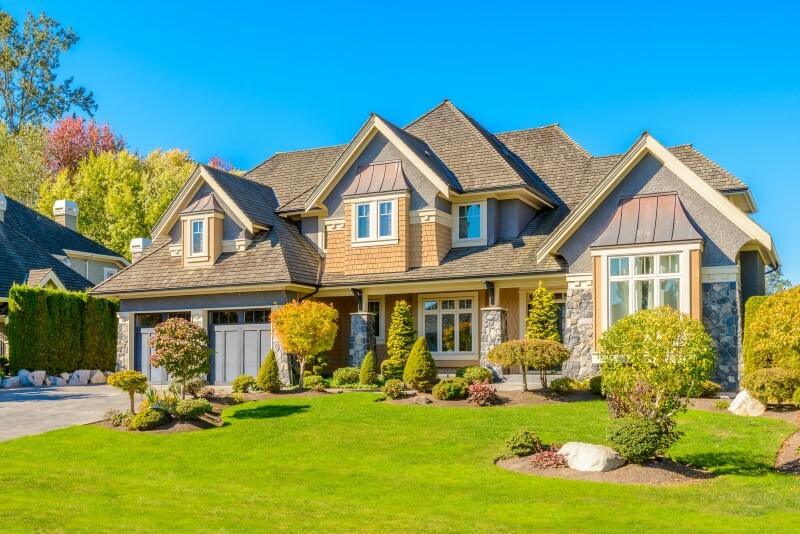 If you currently have a regular shingle roof, most realtors we know recommend upgrading to architectural shingles when it’s time for a roof replacement, because of the all-important curb-appeal boost it gives an older home. As well as keeping the house dry, the roof contributes greatly to the look of the house, so when building a new house, adding on, or re-roofing, it may pay to consider the options. So where do you begin when you select roofing materials? With the shingles, of course. Because not every roofing shingle can be used on every type of roof, it’s important to select a shingle that works for your structure. For example, a roof with a lot of slope and sharp angles will need a different material than a flat roof. Similarly, structures that can’t handle the load of slate or tile could collapse over time due to their extreme weight. Also, while most people choose single-thickness asphalt shingles, they aren’t always the best option for a property. Yes, it’s true that they are the least expensive, but their lifespan differs from the laminated, thicker asphalt shingle by nearly a decade. Further, it’s not always wise to select simply on price alone. You should also consider how long you plan to remain in your current residence as well. In which case, given its lifespan, a metal roof might benefit your situation more than asphalt ever will. Last, materials like flashing shouldn’t be ignored. A quality roofing job will never ignore proper flashing installation. When installing all exterior work, it’s just as important to a roof’s life that all abutments are water-tight and sealed, no matter their location on the home. If you would like additional information on how we can help you with your roofing project, please contact Frost Roofing today to schedule an appointment. Frost Roofing wants to teach you the fundamentals of how to inspect your roof for hail damage. We will inspect your roof for free also, but watch this video to find out what we look for during these inspections. Need a roofing evaluation or repair? Contact Frost Roofing. 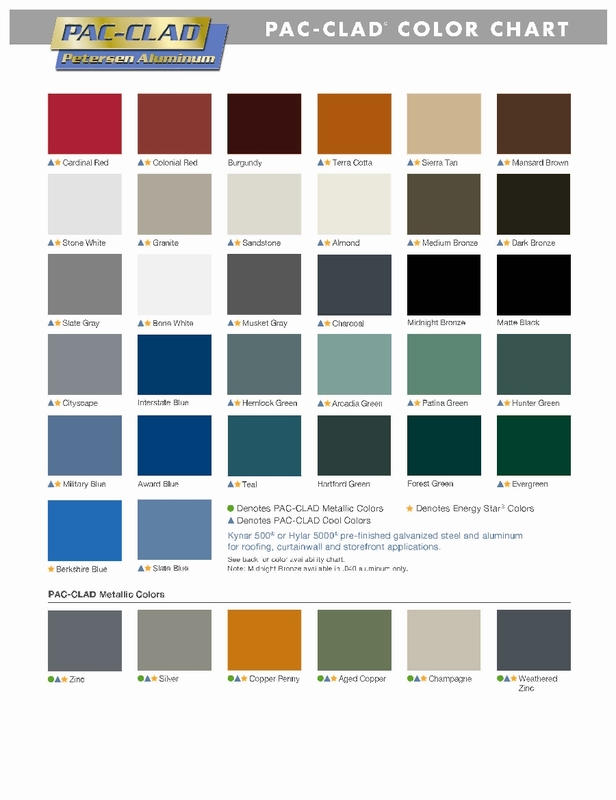 Choosing a color for your new metal roof is an exciting process, especially today, when you have more options available to you than ever before. 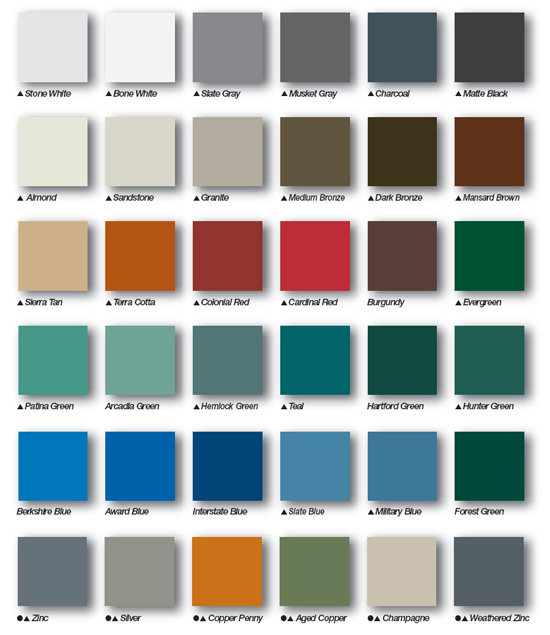 It is important not to get lost in this sea of choices and keep in mind that the color you choose will greatly affect the overall look and feel of your home. Therefore, take your time and research a variety of color options, as well as consider a number of practical and aesthetic factors that are associated with various colors. 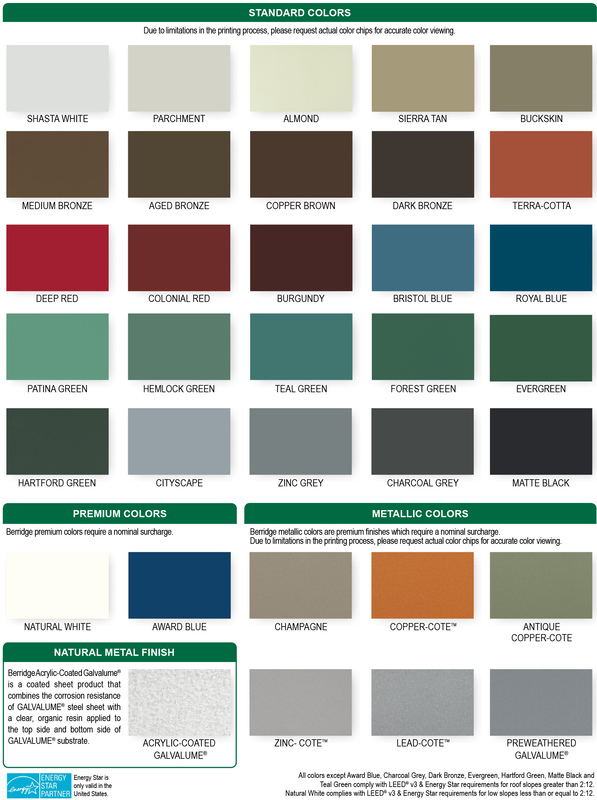 It is crucial to select a high quality paint for your metal roof that will stand up to the elements, while looking fresh and new for years to come. Make sure to choose a paint that has been treated with a special acrylic resin that blocks ultraviolet light. It will help prevent premature fading, peeling, corrosion, rust and water infiltration. It is also possible to apply different types of coatings and sealants as an additional protective layer, which will make the paint last longer, and will protect the metal from sun rays, moisture and mildew. 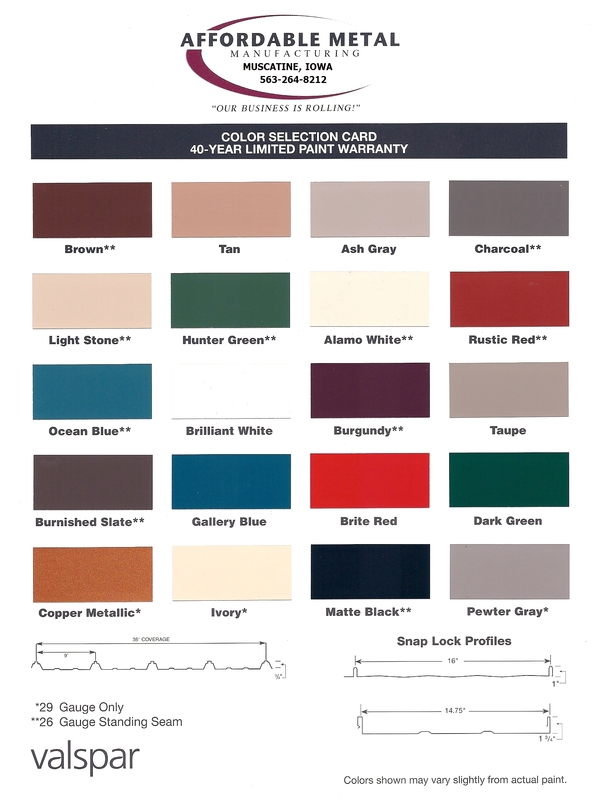 The current industry standard is “Kynar 500” paint finish that comes with a 30 year warranty. 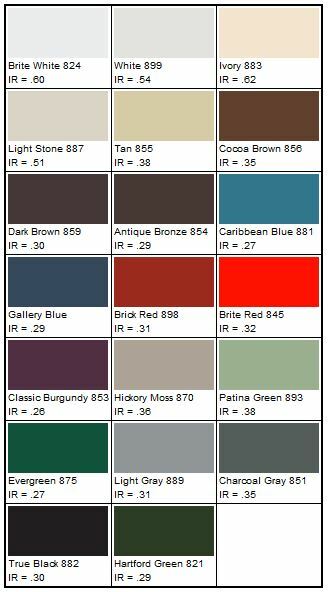 You will probably discover other paint finishes that don’t have the Kynar 500 or Hylar 5000 label. — If you don’t see the EnergyStar and Kynar 500 label or its equivalent, then you are probably looking at lower quality acrylic paint finishes that should be avoided for residential applications. 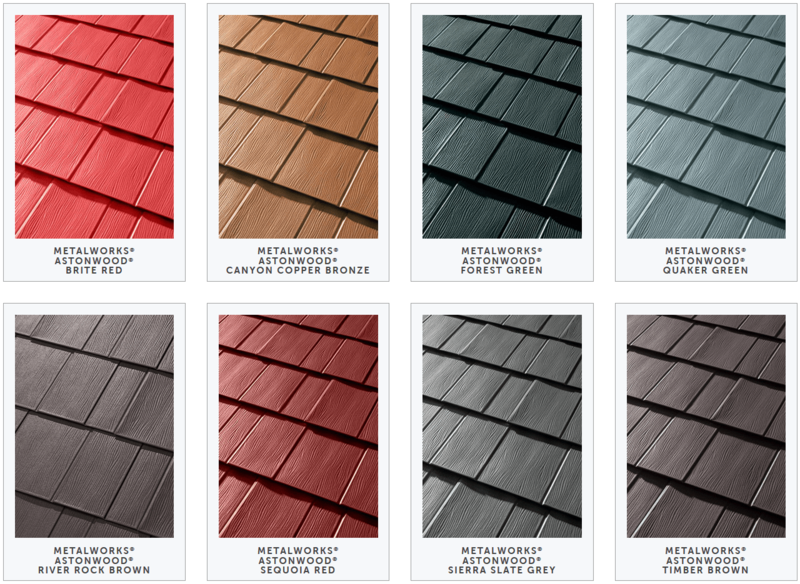 The color of metal that you choose for your roof needs to match the overall style of your home. 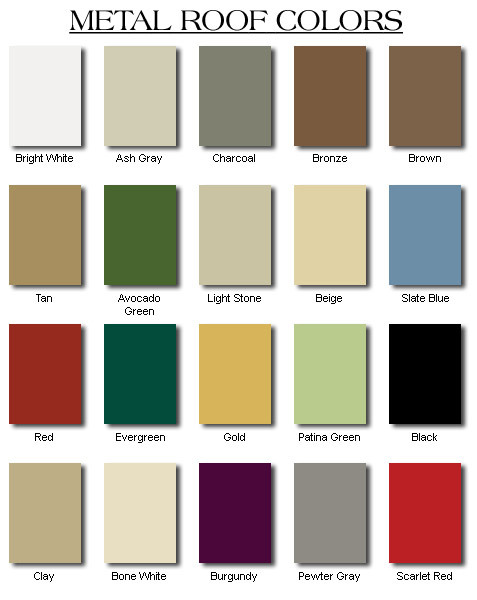 Choose a color based on all the elements of your home’s exterior design, such as the color of the siding, doors, windows, landscape, etc. Remember that a metal roof will keep its original color for years, so you should choose a color that you will be pleased with for many years down the line. As a general rule of thumb, it is best to go for a roof color that complements your home’s existing colors, creating a unified and balanced look. Take a look at different color samples during different times of the day to make sure that you like a particular color both during bright light hours, as well as when the sun is going down and colors look more subdued. 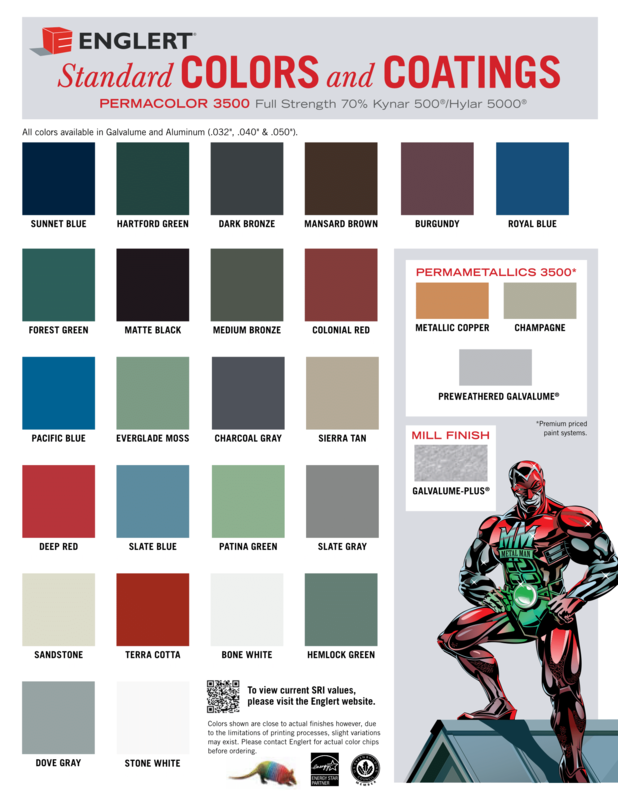 Today, color choices available in metal roofing are virtually limitless, so it is up to you to decide what effect you want to achieve with the color of your roof. Choosing a color for your roof that contrasts with your home’s siding or brick color will instantly help your home stand out and command attention. On the other hand, choosing complimentary colors will create a monochromatic scheme that will convey a more classic look and feel. Another option is to go for an ultra-modern look of bare metal. Steel, aluminum, copper, zinc and other exotic metals all have a natural distinctive color that sets them apart, and can create a beautiful and unique look for your home. It is also important to know that dark vs. light colors have a tremendous impact on the look of your entire home. Having a lighter color roof will make your house appear taller and may be a great option if your home has a low roof, or if it has a shallow pitch. By contrast, darker color can make a tall roof seem less overwhelming. While you want the overall look of your home to reflect your personal aesthetic taste, it is also important to consider the general trends of roof colors in your neighborhood. 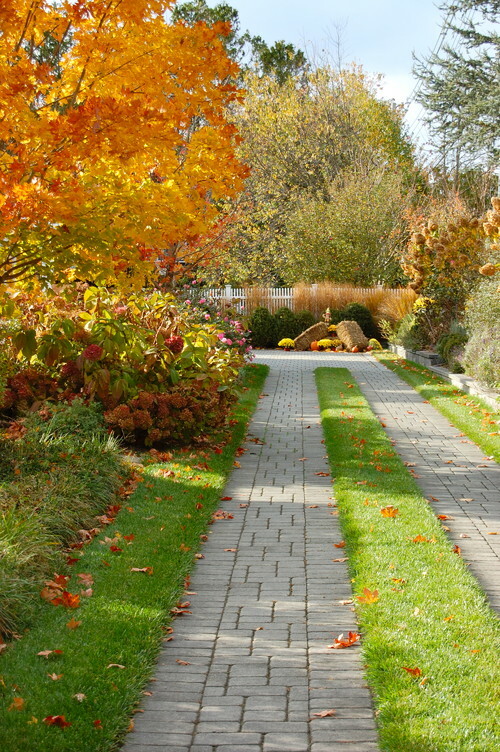 Walk around and get a sense for the “unwritten aesthetic rules” of your neighborhood. Certainly you should pick the color that you like the most, but also make sure that your home does not become an eyesore on the block. The color of your roof plays a major role in helping make your home more energy-efficient, so taking this into consideration will help you save money on your monthly electric bill. Lighter color roofs reflect sun’s heat much better than darker colors. In fact, a white metal roof is Energy Star rated as a cool roof, and can be 50 to 60 degrees cooler than a dark color asphalt shingles roof. It is best to choose a light color metal such as white, light bronze, beige, peach, light green or blue, if you live in a region that has a lot of sun and a hotter climate. A lighter color of the roof will protect your home from unpleasant heat, as well as help lower your monthly energy expenses by as much as 20-30%, as well as help reduce the load on your AC systems in the summer. On the other hand, if your home is located in a cooler climate or you happen to live in a house that has a remarkably well-insulated and ventilated attic space, then choosing a darker color won’t have an impact on your home’s energy performance. 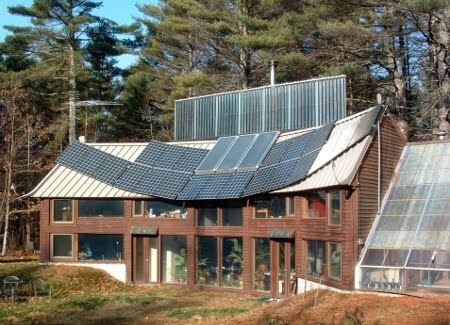 To achieve the most energy efficiency and to make your home greener, you can also consider installing photovoltaic solar panels on top of your standing seam metal roof. PV Solar panels can be easily integrated with standing seam metal roofs, without compromising your roof’s beautiful looks or structural integrity. 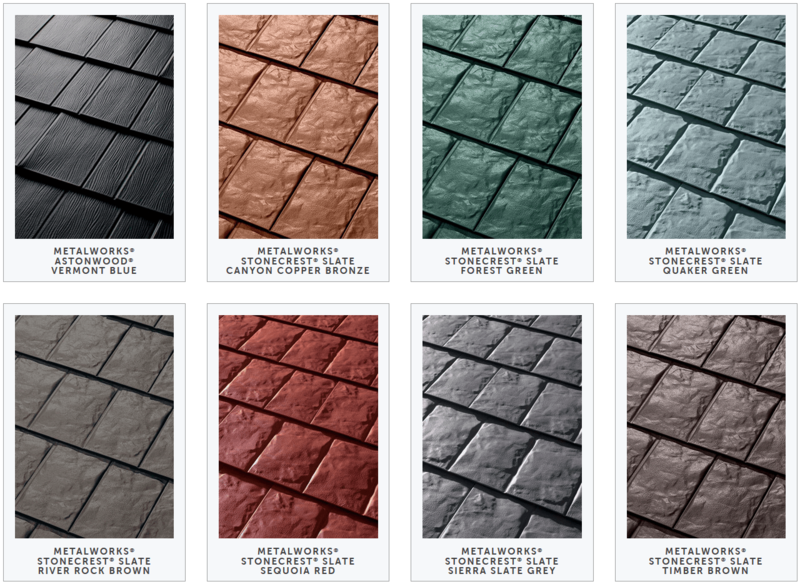 The beauty of metal roofing is that it comes in a virtually limitless variety of colors and profiles. 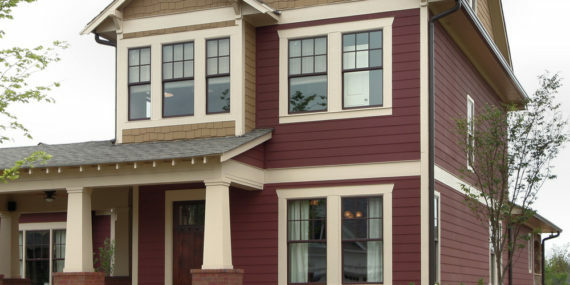 If you want to achieve a highly sophisticated and original look for your home, it is possible to order custom colors in just about any profile that will match a specific palette. 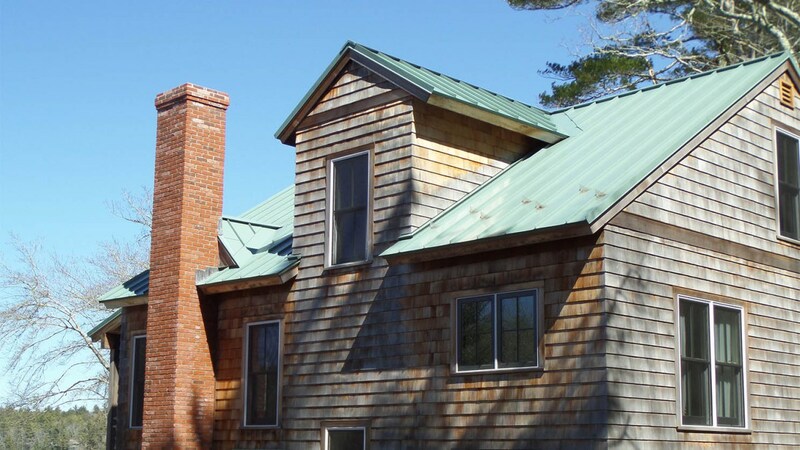 You can even order custom levels of gloss or shininess for your metal roof. 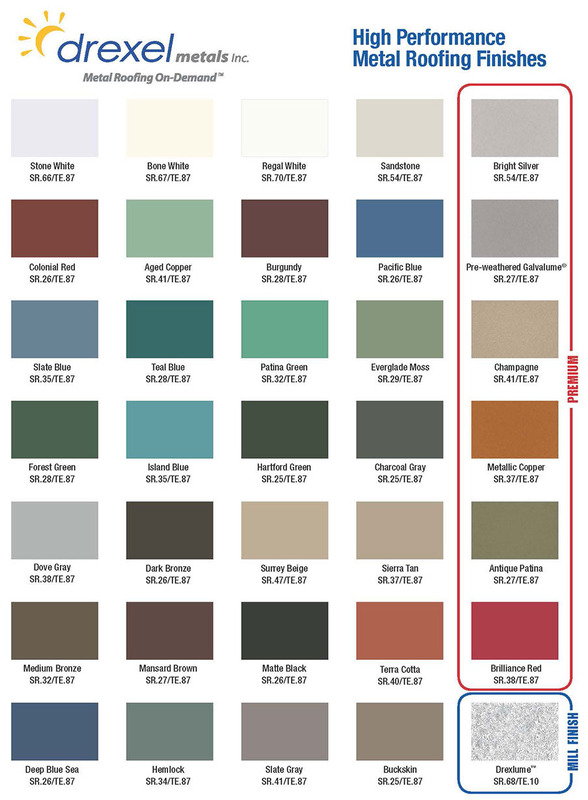 In addition to custom, solid colors, new technology makes it possible to produce a number of two-tone and variegated colors that can add a lot of aesthetic appeal to your roof. 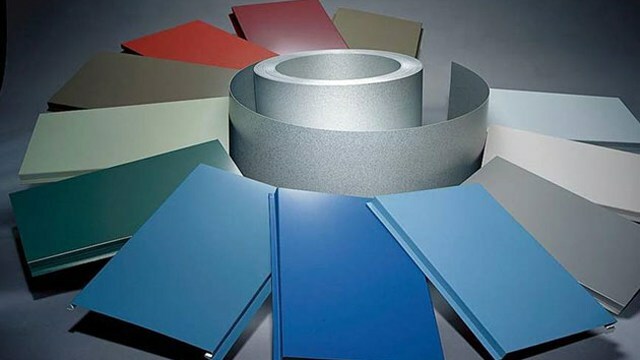 Custom colors cost more and there are minimum quantities of material that a manufacturer or supplier will require. However, the larger the job, the more reasonable the price for customization will be, and in this case the extra cost may be well worth the premium, custom look you will get. 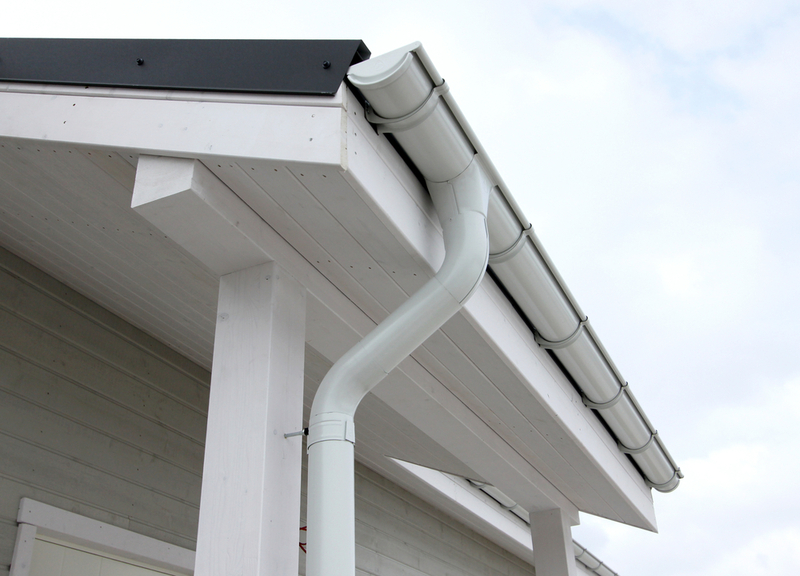 Gutters and downspouts are installed along a roof’s edge to capture and direct runoff. A clogged or damaged gutter often fails to move water away from the structure efficiently and can lead to puddling, leakage and even structural damage. Clean out and inspect gutters at least twice a year or more frequently if damage is suspected or nearby trees lose enough leaves to potentially clog up the gutter or downspout. Always use caution when working on a ladder. Make sure the ladder is firmly planted on even ground and use a spotter. 1. Scoop leaves and major debris out of the gutter. Either place removed materials in a bucket securely attached to the ladder or drop them onto a tarp on the ground. 2. Flush smaller debris out of the gutters with a hose. As the fine materials move with the water, watch the underside of the gutter for leaks and make sure water exits freely through the downspout. 3. Unclog the downspout if water is not flowing freely. If the downspout connects to an underground pipe, remove it from the pipe. Use a strong spray of water to loosen debris. If the hose fails to clear the downspout, use a plumber’s snake to break up the clog. 4. Check for standing or extremely slow-moving water in the gutter. If water fails to flow toward the downspout efficiently, the slope is inadequate. Spikes or hangers require relocation up or down to create a slight slope toward the downspout. 5. Look for space between the gutter and wall or fascia, especially if water runs down the side of the wall during rain events. The spikes or hangers can work themselves loose over time and may require replacement or resecuring so the gutter is securely attached to the structure’s rafters through the fascia, if present, and the roofing material overhangs about one-third of the gutter. 6. Identify seams, ends or other parts of the gutter where sealant is missing or leaks are observed. Leaks along the seams or end caps are repaired by removing old sealant and applying new material. Holes in the body of the fiberglass or aluminum require more extensive repairs or replacement of the section. Tip: It is often easier and less messy to clean out gutters when no rain events have occurred for several days and debris is dry. If debris is soggy, wear latex or rubber gloves under regular work gloves. Warning: Always use caution when working on a ladder. Make sure the ladder is set on level, firm ground and have another person hold the bottom steady. 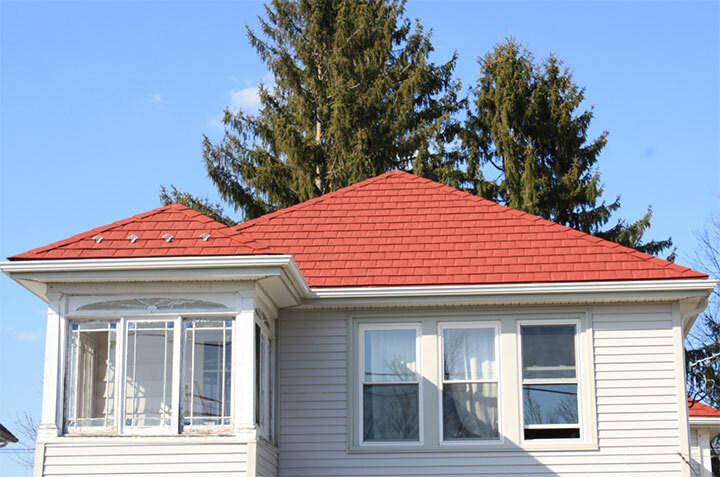 Whether you’re putting a roof on a new home, or your existing roof requires a total makeover, there are many materials available. But no matter what roof style you have, metal roofs can be an attractive option because of their longevity, minimal maintenance, and energy efficiency. 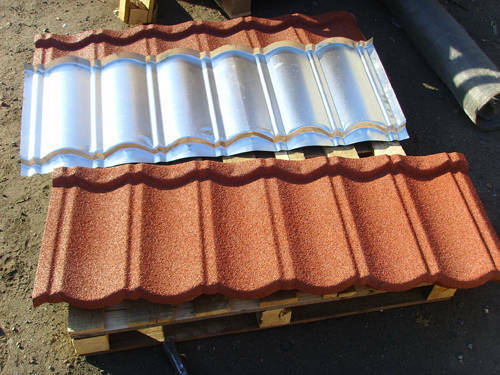 And you can choose from tin, zinc, aluminum, copper, or galvanized steel — just make sure your metal roofing material is tested and labeled by UL, FM Global, or the equivalent, and that you check with your local building department for any code requirements. Longevity. Metal roofs can last 40-70 years, depending on the material. Traditional asphalt roofing materials have an estimated life expectancy of roughly 12-20 years. Durability. 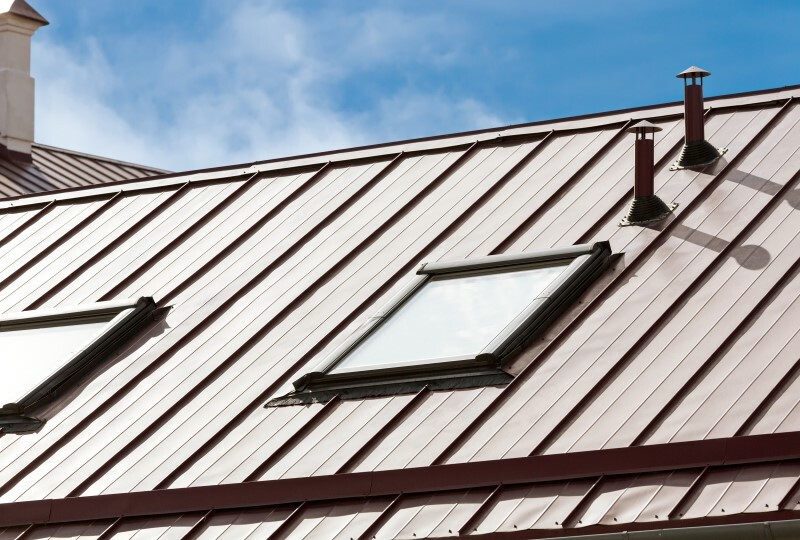 Some metal roofs can sustain wind gusts up to 140 miles per hour, will not corrode or crack, and may be impact-resistant (depending on which metal you choose). In addition, metal roofs don’t need the periodic costly maintenance that other roofing materials often require. However, they should be inspected periodically to make sure no repairs are required. Environmentally friendly. Metal roofs not only have 25-95% recycled content, depending on the material used, but are also 100% recyclable at the end of their life as a roof. In contrast, most shingle tear-off waste ends up as part of the building-related waste stream — up to 20 billion pounds per year. 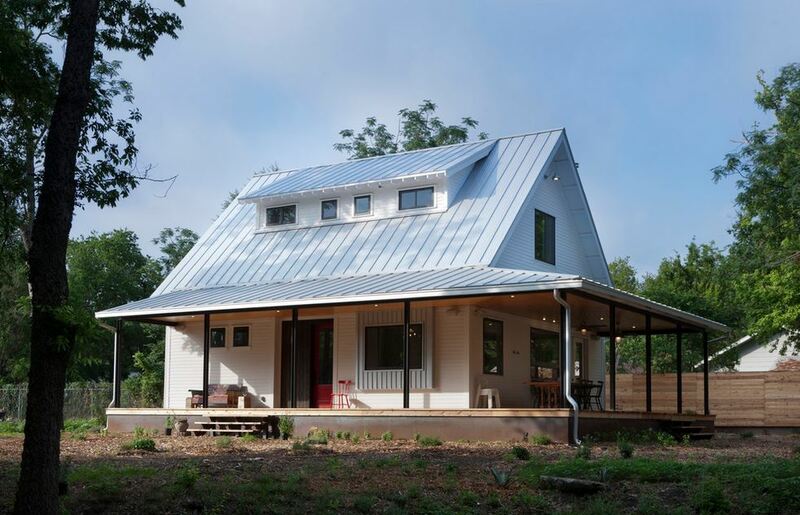 Despite their many advantages, metal roofs have some potential drawbacks. 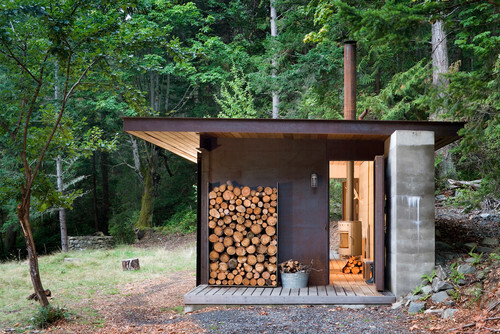 Affordability. 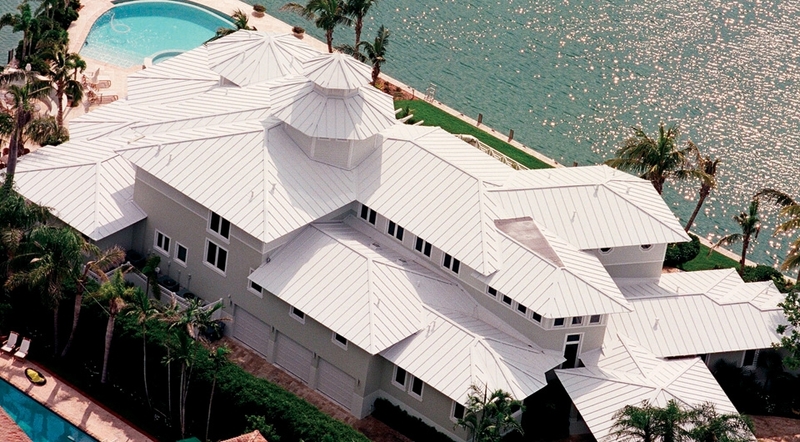 Metal roofs can be as much as two or three times more expensive than other roofing materials. While the life of a metal roof is much longer, investing in a metal roof only makes sense if you plan to stay in your home long enough to enjoy the cost benefits. Noisiness. Metal roofs can be noisy, especially during a heavy rain or hailstorm. Adding more insulation during installation usually solves this problem, but that may increase costs. Expansion and contraction. Metal roofing materials that are attached as large panels tend to expand and contract. If they are not properly installed with fasteners that allow the metal to ‘breathe,’ the panels may loosen. Inconsistency of color match. If a repair is required or a home extension is added years later, it may be difficult to find an exact match to the existing metal. Performance. If water accumulates anywhere on the roof because of poor-quality installation or repair, it can eventually cause serious damage. 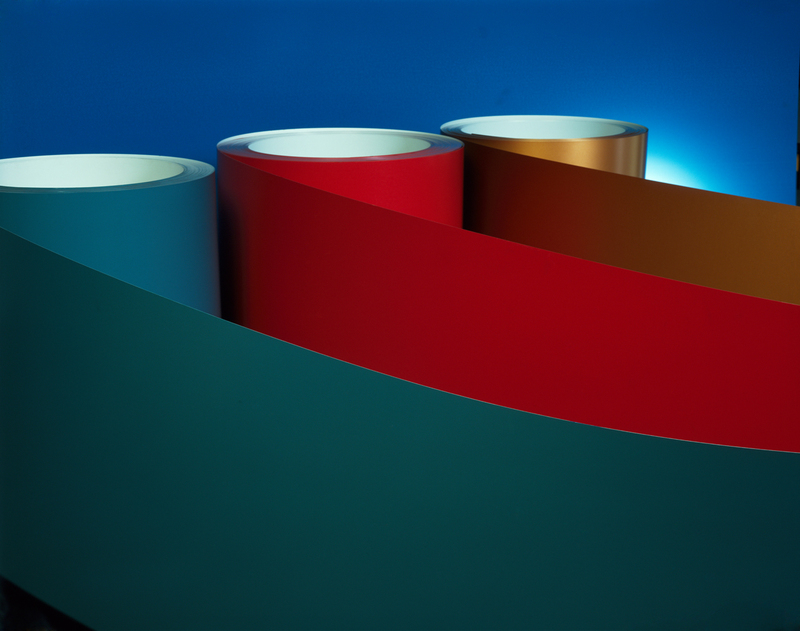 Low-grade metals may also be thinner and less durable. Some metals rust in certain climates or dent more easily than others during hailstorms or installation. 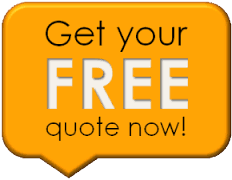 Call Frost Roofing Today to get a quote for a roof upgrade to a metal roof.